Today, when you order "Extreme Rubber Band Magic Joe Rindfleisch, DVD", you'll instantly be emailed a Penguin Magic gift certificate. You can spend it on anything you like at Penguin, just like cash. Just complete your order as normal, and within seconds you'll get an email with your gift certificate. 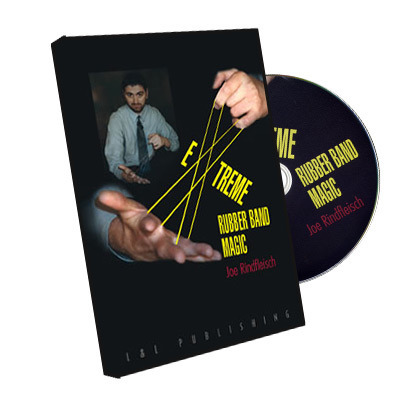 Joe Rindfleisch has taken rubber band magic to an entirely new level and on this DVD, you'll see effects that will fool even experienced band workers. Besides the usual penetrations and broken band restorations (and Joe has some groundbreaking work on those, also! ), you'll watch (and later, learn) effects with rubber bands that have appeared no where else in the literature of magic aside from Joe's work. What's more, the effects are grouped in performance sets, allowing you, once mastered, to perform mini-acts of rubber band wizardry. This DVD is about equal parts good and bad, which is why I rated it three stars. - Joe has some SUPER creative ideas you won't see anywhere else. - The stuff is well taught and there is nothing on this DVD that you can't learn. - The stuff is, for the most part, original and stuff you haven't seen before. - Material presented here is POWERFUL. - Joe can NOT perform at all. He tries desperately, but the few "funny" lines he says are ALL groaners and spread INCREDIBLY conservatively around this DVD. - Because Joe can't present, this DVD is incredibly boring. I dunno, overall, I liked it, and there is some good material. Just sitting through silence and explanation of telling you exactly what he is doing as he is doing it for 2 hours might just put you to sleep. I love rubber band magic so I really want to like this dvd. However, it just has some elements that don't sit right with me. First is Joe Rindfleisch himself. His performance persona annoys me. It makes this dvd hard to watch. 2nd some of the tricks seem repetitive. this gets old. What I do like is the large variety offered. Some of these tricks are evolutions of old classics. They are also broken up into 6 full routines that flow well together. If you are new to rubber band magic I would recommend Dan Harlan's rubberband magic dvds or Bandshark, all available from Penguin. 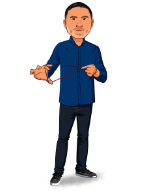 If you are experienced with rubber band magic and are looking for something new then maybe you will find it here.